The annual Easter Discovery Trail is returning for the school holidays – and this time it’s llamas taking over! 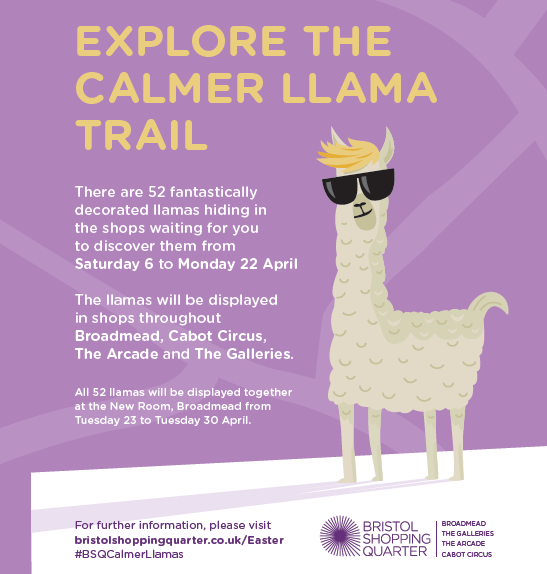 Between April 6th-22nd, 52 brightly coloured llamas, decorated by local schools and youth groups, will be hiding in the shops throughout Broadmead, Cabot Circus, the Arcade and the Galleries in Bristol Shopping Quarter. Pick up a trail map from us (The New Room/John Wesley’s Chapel), opposite Boots in Broadmead, then see how many you can find – they all have names! When you have found as many as you can, bring your trail map back to the chapel, spot the final llamas and collect a small chocolate prize and other goodies. This is a great free event, running throughout the Easter school holidays, organised by the Ark Bus team, the New Room and Bristol Shopping Quarter. At the end of the trail, all 52 llamas will go on display in the New Room chapel from April 23rd-30th, so you can also see them all together in a herd! The animals have been named the ‘Calmer Llamas’ to fit in with a theme of resilience and determination. The groups who decorated the llamas were asked to consider things in their lives which they have found difficult and how they have overcome them. They also remembered how it felt when they achieved something they first thought was impossible. The story of Easter is also a story where hope triumphs over adversity, and at a time of great uncertainty and change we felt these themes would resonate with everyone taking part. Matt’s Drop In Mindfulness Meditation sessions – chaplain and meditation teacher Matt Albury will be teaching meditation techniques in the New Room’s visitor centre on Wednesday 10th April from 2-4pm and Wednesday 17th April from 11am-1pm. These sessions are suitable for beginners as well as those with some experience. Matt is an accredited teacher with the British School of Meditation.